요령(搖鈴)은 절에서 승려들이 의식을 행할때 흔들어 소리내는 도구로서 높이 20.6㎝, 지름 6.6㎝의 청동제이지만 도금한 흔적이 남아 있다. 몸은 4각형이고 각 면이 팽창되어 둥근 형태를 하고 있다. 몸 위에는 마디가 하나있는 긴 손잡이가 있으며 몸과 접하는 곳은 후세에 보수한 흔적이 있고 손잡이 윗부분도 손상을 입었다. 손잡이 아랫부분은 둥글며, 큼지막한 꽃이 한 송이씩 아래를 향하고 있다. 몸 전체 각 면을 구분하는 모서리와 입구 주위에 굵은 돌출선을 돌리고 그 테두리 안에 몸을 꼬며 위로 치솟는 용 한 마리와 그 사이 공간에 구름무늬를 도드라지게 새겼다. 각각의 면에 있는 무늬는 하나의 틀에서 찍어낸 듯 하다. 입구 부분은 중앙에 반원형을 만들어 단조로움에 변화를 주었다. 이 요령은 예로부터 송광사에 전해 내려온 귀중한 금속공예품으로서 우아한 형태와 아름다운 조각이 돋보이는, 우리 나라에 현존하는 요령 중에도 걸작에 속하는 동시에 가장 오랜 예로 평가된다. 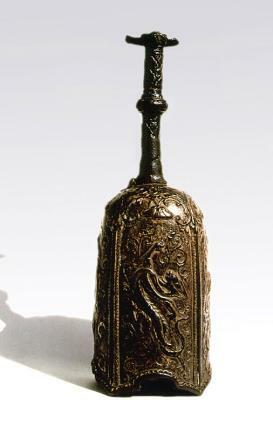 This gilt-bronze hand bell (measuring 20.6cm in height and 6.6cm in diameter) was no doubt used in events, ceremonies and rituals at the temple, and to call monks to sermons. The bell is square in shape and features four bulging faces in a round form on its exterior surface. The long, knotted handle has been damaged and repaired, although the top of the handle is still partly damaged. Each of the four faces on the shoulder is engraved with a flower pattern. The corners and the rim of the open-ended flare are embossed with thick lines. Each face of the main body is carved in relief with a dragon soaring into clouds. The patterns on each face seem to have been made from a mold. Semicircles appear to have been added along the rim of the open-ended flare to add variety. 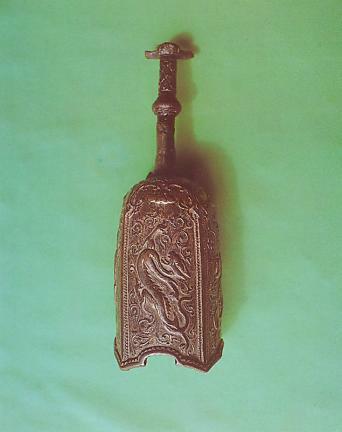 This gilt-bronze hand bell has been handed down and preserved in good condition for many generations at Songgwangsa Temple. It has an elegant form and is skillfully cast, making it one of the most excellent and oldest extant masterpieces of its kind in Korea. As such, it is presumed to have been made during the early Goryeo Dynasty.